The Canon EF-S 18-55mm f/3.5-5.6 IS II Lens is the review-time-current version of Canon's least expensive APS-C DSLR kit lens (replacing the EF-S 18-55mm IS Lens). While it is designed as a starter lens and leaves a lot to be desired, it is a good value when purchased in a kit. It is cheap, small and extremely light, has image stabilization and has a nice general purpose focal length range. I always look for the right focal length range first when selecting a lens to use. The 18-55 IS II will only mount on APS-C (1.6x FOVCF) Canon EOS DSLR Cameras. On these cameras, the 18-55mm focal length range provides the equivalent of a 28.8-88mm lens on a full frame DSLR. This range falls squarely into the range I recommend for general purpose use. Though not exceptionally wide, 18mm will work fine in modest-sized rooms and 55mm will produce reasonable head and shoulder portraits. Tightly cropped head shots will start showing perspective distortion - including big noses - and are are best avoided. Landscapes and other general purpose photography work well in this range. The Canon EF-S 18-55mm f/3.5-5.6 IS II Lens is a relatively "slow" lens - meaning that it has a relatively narrow aperture. Letting in only a relatively small amount of light means that that the 18-55 IS II will not be a great lens choice for stopping action in low light. 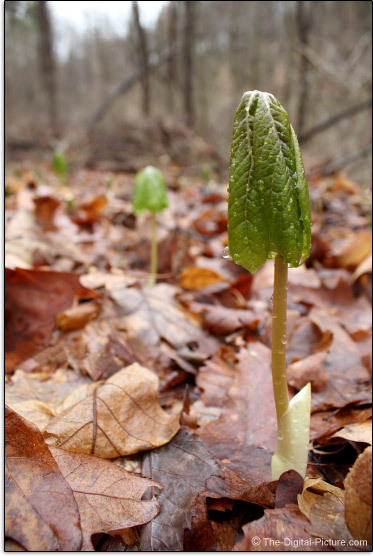 A relatively wide angle focal length range and relatively narrow aperture, along with the coinciding relatively deep DOF (Depth of Field), means that creating a strong background blur is not a strength of this lens. Being a variable aperture lens means that wide open exposure settings are going to change as the lens is zoomed to the longer focal lengths. Here is a table comparing the aperture step down focal lengths with some other Canon lenses. The images in this example were the best of the groups I shot at 55mm with a .4 second exposure duration with and without IS engaged. The (very rough) rule for handholding a camera is that you need a shutter speed of 1/(focal length x FOVCF) or faster to avoid camera shake-caused blur. So, without image stabilization, a 55mm focal length would require a 1/(55 * 1.6) = 1/88 or faster shutter speed which rounds to 1/100. The Canon EF-S 18-55mm f/3.5-5.6 IS II Lens is rated for 4 stops of assistance with each "stop" meaning twice or half as much light. At 55mm, nearly 100% of my 18-55mm IS II handheld images are without camera motion blur at up to 1/13 second exposures. This is an easy 3 stops of assistance. Thus, this lens can be easily handheld in an environment having 1/8 as much light as a non-stabilized lens using 3 stops (1/2 x 1/2 x 1/2) as a guideline. At 1/10 sec, about 50% of my images are sharp at 55mm. The keeper rate gradually decreases as longer exposures are used with a very low percent of images being worth keeping at .4 second exposures (<10%). I'm seeing slightly less assistance from IS at 18mm with about 50% of images being sharp at 1/5 sec. The keeper rate slowly decreases as the exposure duration increases - with a couple of sharp images being made at .8 seconds. To get these results, very good form must be used. Don't expect to run up a mountain on a windy day and quickly shoot handheld images with good results at shutter speeds anywhere near as long as these. Also, image stabilization does not stop subject movement (you need a faster shutter speed for this), but image stabilization is great for still subjects. 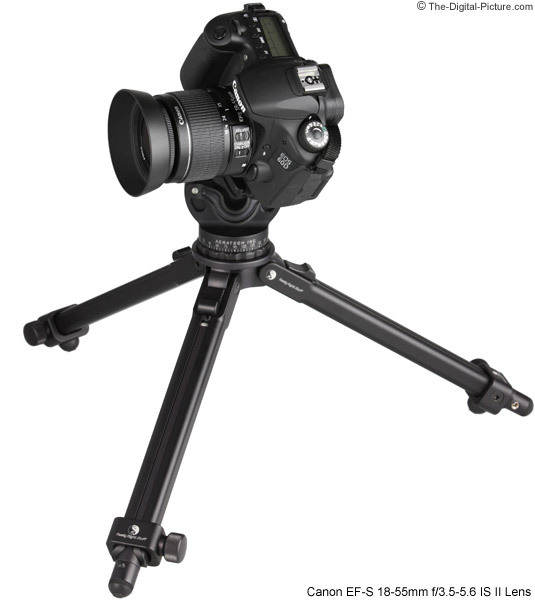 I will also note that even when using a lens with IS, I use a tripod when I am able to. The 18-55 IS II' image stabilization is very quiet. If you put your ear against the lens in a quiet room, you can hear very quiet clicks. You will not hear these clicks in normal use and no one else will hear the clicks. As I said in the beginning of the 18-55 IS II review, the "II" replaces the "I". "The version II of this lens includes new IS algorithms to distinguish between normal photographing and when the camera is panning to automatically provide the optimal level of image-shake correction." For the price of this lens, it has rather impressive image quality. I've been struggling to bring you an accurate description of this lens' sharpness. It performs very well on the resolution chart, with reasonable sharpness into the corners. Stopping down (narrower aperture, higher aperture value) the lens to f/8 results in a slight improvement in sharpness. By comparing the 18-55 IS II to an expensive, high grade prime lens (the Canon EF 200mm f/2L IS USM Lens), we can see its obvious shortcomings in contrast. 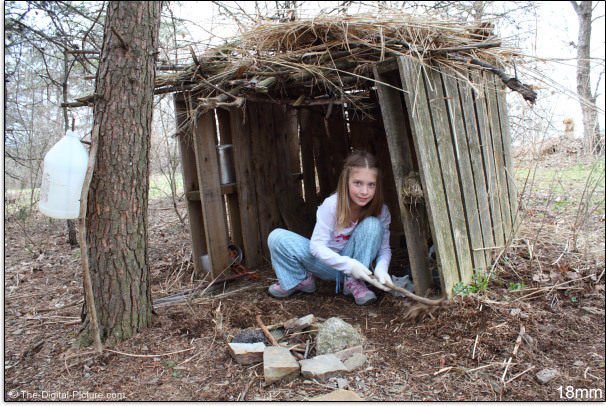 Outdoor testing also makes 18-55mm IS II image quality weakness apparent in some locations within the frame. Some areas within the frame compete with the better lenses, but here are two examples where the 18-55mm IS II falls short throughout the focal length range. Click on the image below to see an image quality comparison between this lens and some other similar focal length range lenses. You will see what the additional investment buys you. Make no mistake - the 17-55 is a significantly more expensive lens. But, it is important for you to know the image quality you get with the 18-55 and the image quality you could have. Overall, the 18-55 IS II shows a relatively small amount of peripheral shading/vignetting. One stop of shading means 1/2 as much light reaches the sensor corners. With a wide open aperture (f/3.5), expect just over two stops of vignetting at 18mm. By 24mm (f/4), a still-slightly-noticeable 1.2 stops of shading remains. Vignetting decreases through 55mm (f/5.6) where about .8 stop remains. As usual, stopping down the lens reduces vignetting, though just over a stop of shading remains at 18mm f/8. While I don't recommend putting a UV or clear protective filter on this lens (a good filter will cost too high of a percentage of the value of this lens), a standard thickness filter will add a very slight amount of peripheral shading. I love circular polarizer filters, but a standard thickness filter will add nearly .5 stops of physical vignetting to the image corners. A slim CP filter will avoid most of this shading. But a slim CP filter does not give us clear sailing - the filter rings on this lens rotate when focusing. Since CP filters are orientation-specific for their effect, keeping the filter properly rotated requires plenty of patience. The 18-55 IS II does not show a significant amount of flare, but it is visible - especially at 55mm. A noticeable amount of barrel distortion is present at 18mm. Distortion transition to slight pincushion at 35mm and continues through 55mm. Ideally, OOF (Out of Focus) points of light remain circles even with a stopped down aperture (where the number of blades and blade shape affect the results the most). The 18-55mm IS II has curved aperture blades, but it has only 6 of them. 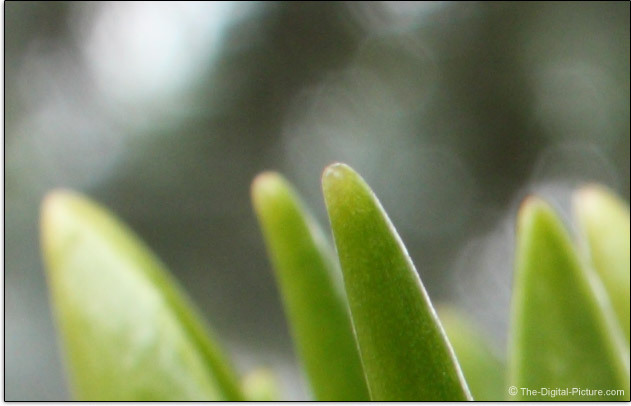 I can clearly see 6 sides in OOF highlights in some stopped-down-aperture images as shown in the bokeh (quality of the background blur) example above. Because this lens does not create a strongly blurred background unless shooting at minimum focus distance at 55mm, I didn't find the 18-55 IS II's bokeh to be much of an issue. As I mentioned a couple of times in this review, the "II" replaces the "I". Optically, I'm not seeing many differences between the two lenses - my "I" is my very slight preference to my "II" optically. And Canon does not indicate that any optical design changes have been made. 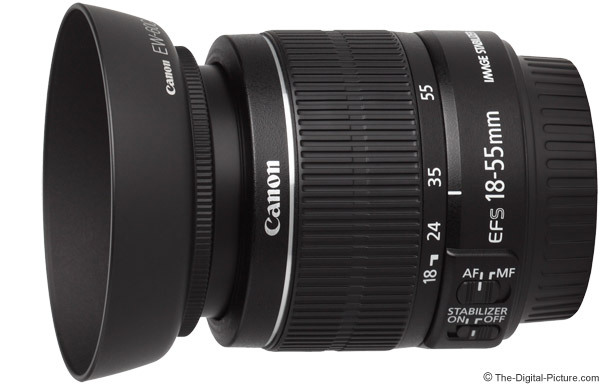 The Canon EF-S 18-55mm f/3.5-5.6 IS II Lens' micro motor-driven AF focuses at a moderate speed. Focusing is audible - a modest buzzy sound is heard as the lens adjusts to locked focus. I have found focus accuracy to be very consistently accurate. Of course, generally deep DOF makes AF precision less critical/noticeable. Like its predecessors, the 18-55 IS II extends when focusing and, like I said earlier in the review, the front of the lens rotates when focus is adjusted - You should avoid contact with it during autofocus. FTM (Full Time Manual) focusing is not available - manual focusing should only be done with the AF/MF switch in the MF position. Precisely manually focusing this lens is a significant challenge. The focus ring is the extending portion of the lens including the Canon EW-60C lens hood if you buy this optional accessory. There is a small raised area near the end of the lens extension that I would call the "focus ring", but I'm being generous with this definition. The manual focus ring is not very smooth, but the much bigger problem is that there is a lot of play in the extending portion of the lens. Not only does rotating the focus ring change focus, but even slight side-to-side pressure changes both the focus and the subject framing. I reserve manual focusing this lens for emergency/mandatory use only. Those of you bold enough to do serious video work with this lens will have a small amount of focus breathing to work with. Don't bother trying to pull video focus with this lens - your viewers are sure to become motion sick. There are no focus distance markings on this lens. The 18-55 IS II' maximum magnification value is a very healthy .34x. This means that a subject can be rendered at .34x life-size onto a sensor. While not a macro lens figure, .34x is very useful for flowers and other moderately small subjects. Above is an MFD example taken at 18mm, f/5.6. Extension tubes will allow significantly greater MM when used behind this lens. No current-at-review-time Canon EF-S Lenses are compatible with Canon extenders. 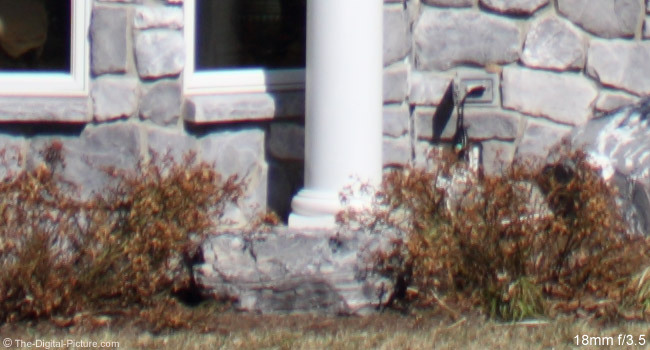 The 18-55 IS II extends when zoomed with the shortest physical length being achieved around the 30mm focal length as seen in the example above. As I said before, the extending portion of the lens has a lot of play in it, but the zoom ring itself is reasonably smooth with no play. The size of the zoom ring, consuming most of the barrel, makes it easy to find and use. The 18-55 IS II features all plastic exterior construction including a reserved-for-the-cheapest-lenses plastic lens mount. The upside is that this is a very small and very light lens. You barely know it is there. The 18-55mm IS II lens' small 58mm filter size means that filters are, like the lens, relatively inexpensive. 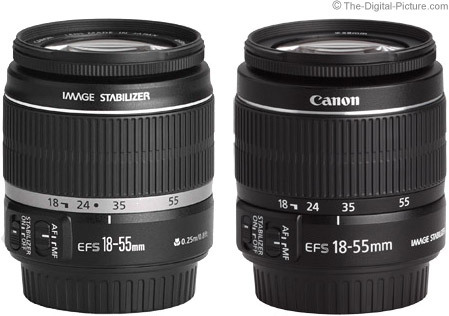 For many more comparisons, review the complete 18-55 IS II Specifications using the site's Lens Specifications tool. At review time, all of the Canon EF-S Lens hoods are optional accessories. I always use a lens hood and highly recommend them. The Canon EW-60C is the specific lens hood model for the 18-55mm IS II. It is very small and does not inhibit access to the lens cap or a filter. The small size of this lens, even with the lens hood installed, does not block the built-in flash (tested on the T3i). Attaching/removing this lens hood is not especially easy since the bayonet mount requires a twisting action to seat it into place or remove it. This twisting causes the focus ring to turn - which drives the gearing inside the lens if in AF mode. Best is to get a grip on the inner barrel (preferred) or turn the focus ring in M mode until it reaches the end of its travel before twisting the lens hood to its desired position. Click on the image below to compare the Canon EF-S 18-55mm f/3.5-5.6 IS II Lens to other lens models with and without hoods (opens in new window to save your place in this review). As I complete this review, the "II" is only available in a DSLR kit (initially with the Canon EOS Rebel T3i / 600D and Canon EOS Rebel T3 / 1100D) - or used. 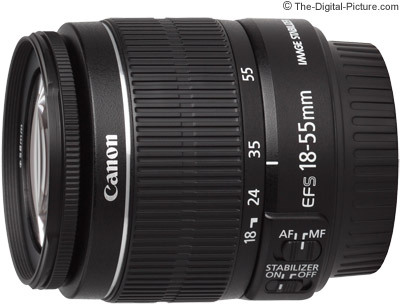 The Canon EF-S 18-55mm f/3.5-5.6 IS Lens eventually became available for individual purchase, so the "II" may also. My advice? If your funds allow, I strongly recommend buying (now or later), one of the better Canon general purpose lenses available. As of review time, the Canon EF-S 17-55mm f/2.8 IS USM Lens and Canon EF-S 15-85mm f/3.5-5.6 IS USM Len are my most-recommended general purpose APS-C/1.6x lenses with the Canon EF 24-105mm f/4L IS USM Lens and the Canon EF 24-70mm f/2.8L USM Lens being excellent alternatives. Need a lens for your kids? The 18-55 IS II is an ideal one for them. You do not need to worry about them damaging your prized expensive lens. The small size makes the 18-55 IS II ideal for kid-sized hands and the light weight is manageable by kids for long periods of time. Need a sacrificial lens for a lens-dangerous shoot? Even if the 18-55 IS II does not make it back, the loss is not great. If you need a general purpose lens, and the Canon EF-S 18-55mm f/3.5-5.6 IS II Lens reaches the limits of your budget, it is a good choice. It is cheap, small and extremely light, has image stabilization and has a nice general purpose focal length range. 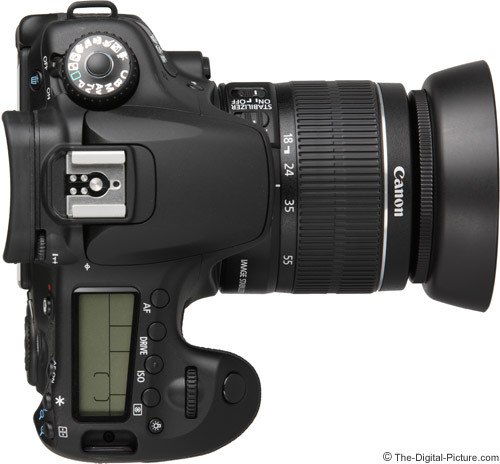 Best of all, it gains you entrance into the incredible world of Canon EOS DSLR cameras and the incredible image quality they deliver. You can upgrade the starter lens later.